Young musicians (from left) Monica Morris, Maryn Parr, Alison Edwards, and Nathan Thomas, were among those who joined the Northern Tier Symphony Orchestra following last fall’s open rehearsals. The next open rehearsals will be held on Feb. 16 at Tunkhannock Area Middle School. When the Northern Tier Symphony Orchestra holds open rehearsals next month for its upcoming series, musicians of all ages will be hoping to play in one of the orchestra’s concerts. Some will be professional musicians, to be sure, but anyone has a chance. Last year, four high school students gained spots on stage. 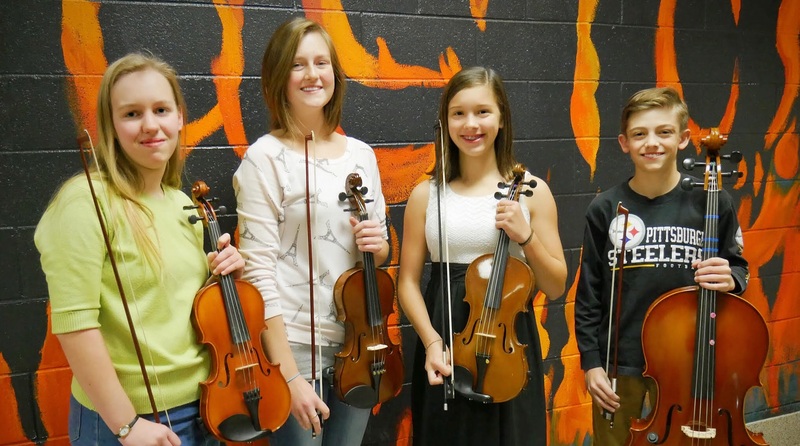 They include violinists Monica Morris of Meshoppen, Maryn Parr of Tunkhannock, and Alison Edwards of Tunkhannock, and cellist Nathan Thomas of Mountain Top. Edwards called the audition experience “a bit intimidating,” but added that the feeling subsided once she started performing with the orchestra. “I feel like I fit in with a lot of the younger musicians,” she said. The orchestra will begin rehearsals for the spring concert series on Friday, Feb. 16, from 7:30 to 9:30 p.m. at the Tunkhannock Area Middle School auditorium. Musicians who would like to participate should call (570) 289-1090 to discuss openings and obtain the music piece for the rehearsal. There are openings for all instruments, especially strings. The spring concert series is scheduled to include performances at Blue Ridge High School in New Milford on Friday, April 13, and at Tunkhannock Area Middle School on Friday, April 20. The concerts will feature Tchaikovsky’s 1812 Overture, West Side Story, Victory at Sea, España, Waves of the Danube, and Washington Gray’s March. The Northern Tier Symphony Orchestra was founded in 2010 as a non-profit community orchestra with the goal of bringing live classical music to the Endless Mountains region of Pennsylvania. It is based in Tunkhannock, where it presents several concerts each year. Concerts are also presented at other locations in the Northern Tier. The Northern Tier Symphony is a non-profit community orchestra. For more information, contact the orchestra at 570-289-1090, e-mail northerntiersymphony@yahoo.com, or visit www.northerntiersymphony.org.